The Eloquent Woman: Famous Speech Friday: Viola Davis: "Everything should be spoken"
Famous Speech Friday: Viola Davis: "Everything should be spoken"
Viola Davis is among my favorite speakers here at The Eloquent Woman and she's in the very small club of women with three speeches in our Index of famous speeches by women. 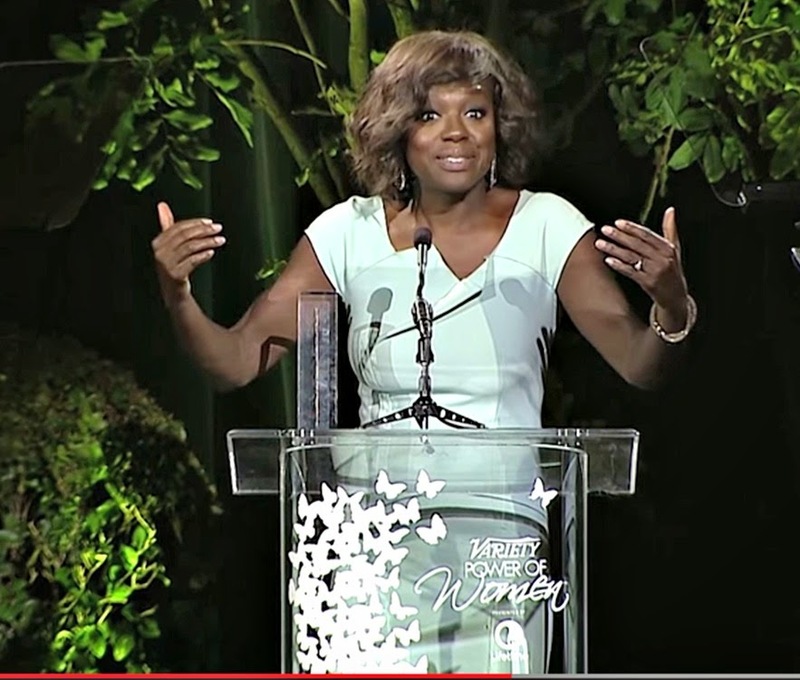 This speech, in which she accepted an award at Variety's Power of Women luncheon in 2014, got immediate and widespread attention and is a great, short example of why I admire her so. You know they say that you're never too old to have a happy childhood. And although my childhood was filled with many happy memories, it was also spent in abject poverty. I was one of the 17 million kids in this country who didn't know where the next meal was coming from. And I did everything to get food. I've stolen for food. I've jumped in huge garbage bins with maggots for food. I have befriended people in the neighborhood who I knew had mothers who cooked three meals a day for food. And I sacrificed a childhood for food and grew up in immense shame. And the word that I would like to eradicate today is unspeakable. Because I think everything should be spoken. I think everybody's testimony should be spoken. I think everybody's shame should be spoken. And the stain that is on this country is that one out of every five children in this country are living in households that are food poor. And of all the elementary school teachers out there they say that three out of five of the kids in their class, come to school hungry in the richest country in the world. Say it plain: Davis's words have so much more impact because she did not strive to make them smooth, rounded, elegant or complex. It's hard to have more impact than "I've stolen for food," or "I've jumped in hug garbage bins with maggots for food." Use data wisely: This is Hollywood, so it's important that the speech not sound all about her. Davis weaves just a few key data points into her speech, noting she was one of the 17 million kids with hunger, or that three out of five elementary schoolchildren come to school hungry. The data keep this from being an ego trip, but by using them judiciously, she makes sure they, too, have plenty of punch. Look what you can do without a script: Davis has said she never prepares written remarks, claiming it would scare her more. So you'll hear ums and pauses aplenty, and yet she's among the most eloquent extemporaneous speakers I've heard. Why does this work? It's a personal set of stories and perspectives, spoken from the heart. Watch the video below and think about how you can have more impact when you accept an award.